Who wouldn't want to be served by flying shoe-delivering drones at a shoe store? This proof-of-concept video shows our thrilling, shoes in mid-air future. The flying Norlin project" was made to celebrate ten years of Crocs in Japan -- yeah, you see a lot of pairs of Crocs here. The concept is the company's perhaps overly-elaborate way of explaining how light its new sneakers are. The custom-built drones have arms especially built for hooking the sneakers of your choosing, and this particular flyer can handle up to 600 grams -- enough to handle one of eighty pairs on show several meters high. To reiterate, the new shoes are light. Let's not forget that. Very light. Yes. 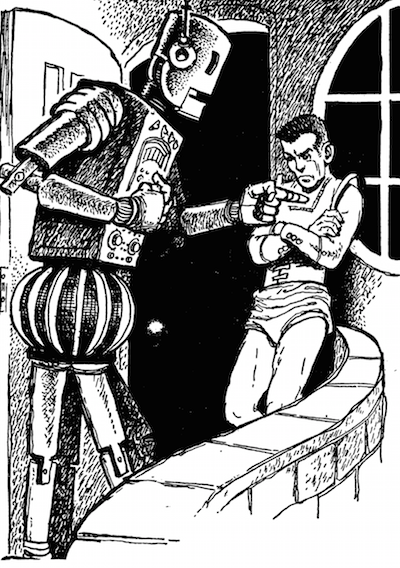 Robot-salesmen were everywhere, gesturing, pleading, shrilling. One started after him and he quickened his pace. It scurried along, chanting its pitch and trying to attract his attention, all the way up the hill to his living-unit. It didn't give up until he stooped over, snatched up a rock, and hurled it futilely.